UPDATE: We have a winner! #TeamMerrill's Soft Chocolate Almond Cherry Cookies stole your hearts, and #TeamAmanda's Chewy Vanilla Spice Cookies with Chocolate Chunks (Vegan, Too!) are being good sports about the whole thing. Thanks to everyone who came out, ate cookies, and voted, and special thanks to Nielsen-Massey Vanillas for making our Cookie Truck dreams come true. Read on below for the story behind the cookie truck, plus see what happened when it hit the streets of NYC, and find out the strangest answers we got to the question: Do you want a free cookie? Imagine cookies. 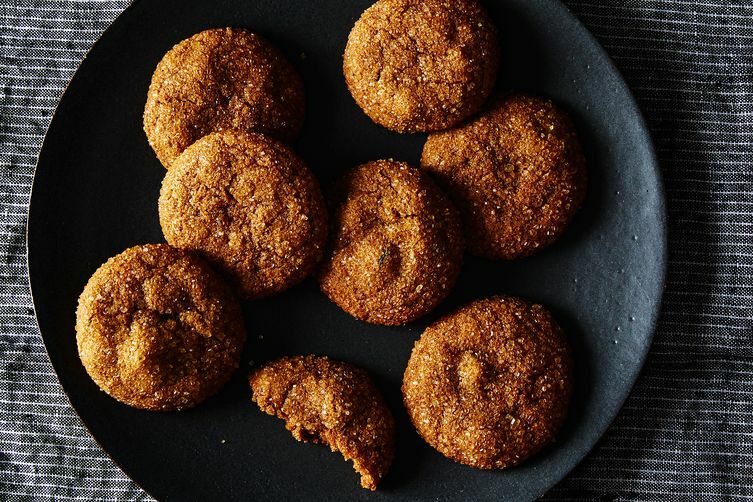 Now, imagine if said cookie recipes came from our co-founders Amanda Hesser and Merrill Stubbs. You’re probably thinking something along the lines of, “Yes.” Then imagine if said A&M cookies were delivered in a cookie truck. But wait, it’s no dream! The Food52 Holiday Cookie Truck, presented by Nielsen-Massey Vanillas, will be driving around New York City from December 7 to 13, distributing cookies and good cheer, but—naturally—only after a little healthy competition. Competition, you ask? Well, this isn’t the first instance of a friendly cookie war between A&M (see below for proof!). But this time, they need your help developing recipes! The only requirement is the cookies use vanilla in some form, as all great cookies do. They'll take your suggestions to heart, and then you'll be able to vote for your favorite cookie—Amanda's or Merrill's—from the cookie truck. Our last cookie showdown may have ended in a draw, but this time things are going to get real. And I need every bit of help I can get, because if there's anything Amanda knows cold it's baked goods. I'm looking for a cookie with a good balance of salty and sweet and a crumbly/sandy texture (not chewy). It could involve chocolate, maybe nuts or oats, perhaps some fruit or jam. No meringues or sugar cookies—I’m going for something with a little more oomph! 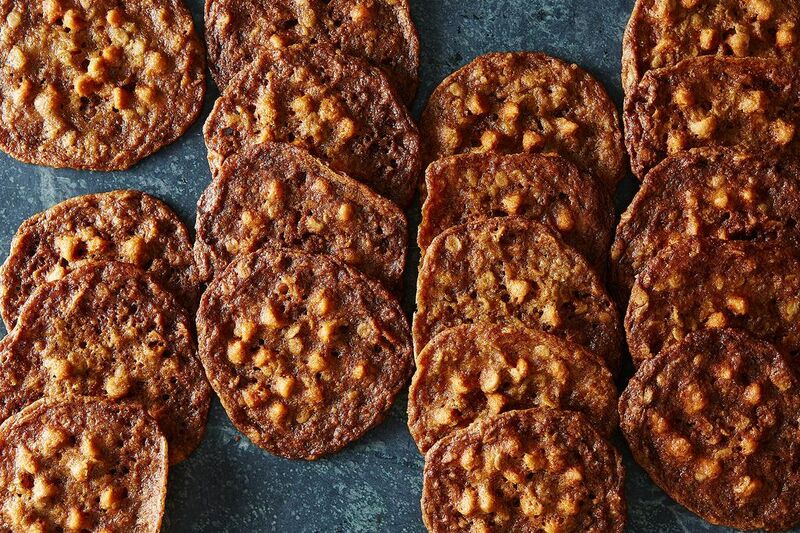 Add your cookie suggestions to the comments below, or Instagram them, tagging your ‘grams with #f52CookieTruck (plus, of course, #teamamanda or #teammerrill). Best Chocolate Cookie Recipe from Food52 on Vimeo. 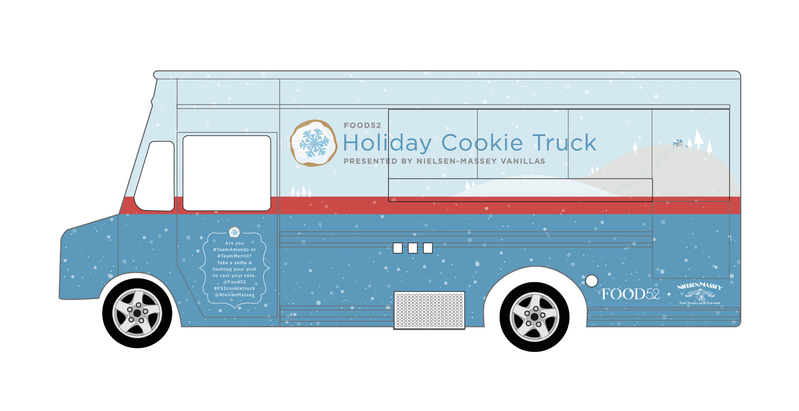 We'll be tooling around New York City from December 7 to 13 in The Food52 Holiday Cookie Truck, thanks to Nielsen-Massey Vanillas. Speaking of branded holiday cookies . . . . . . For years one of my best clients (a successful tech company with a brilliantly scalable SaaS product, requiring a relatively small staff) has given each of its clients and some of their lucky vendors, like me, a large tin -- a bucket, actually -- of holiday cookies that the staff has decorated. They shut down all business activities starting at noon one weekday in early December. The entire staff puts on aprons; a local cookie caterer brings over thousands of just-baked cookies cut into the five letters of the company's name, as well as pastry bags filled with icing, along with giant tubs of it and spreaders. The shipping boxes are all lined, labeled, etc. in advance, so the tins are shipped that night. So thoughtful, so memorable; it's also a team-building activity that the staff looks forward to every year! This may not have as much of an impact on Food52's most important business relationships, as it seems that food-related companies are always giving each other food gifts, but the branding is certainly something to think about. My family has a very old recipe for a Molasses cookie. They are rolled in sugar and very moist in the center. You cannot eat just one! Love this idea. Like a grownup peanut butter and jelly cookie! Amanda: How about a riff on the classic peanut butter chocolate pinwheel cookie, substituting almond butter for peanut butter, adding a lot of vanilla and a touch of ground ginger to the dough, and finely chopped crystallized ginger to the melted chocolate? Thanks, AJ. It's funny because someone on our team made a similar sounding cookie and brought it to the office about a month ago, and I thought about modeling my cookie after it, but then backed away. Going to ponder! For years, I searched for a go-to chocolate chip recipe, and then I found it in the Ad Hoc Cookbook. I absolutely love Thomas Keller's chocolate chip cookie recipe! One of the genius aspects to the recipe is his addition of molasses sugar to the dough. I use my food processor to make my own molasses sugar. I follow Alton Brown's measurements, but use turbinado raw sugar and unsulphured blackstrap molasses. Hope you get to test them out! Interesting -- thanks for the tip! I don't remember those -- will have to look them up! Did they have chocolate in the center? Blackmarket Bakery in Costa Mesa,CA has a wonderful florentine cookie. A shortbread like crust topped with a caramel/honey/ginger mixture and topped with almonds and cranberries. Perfection. A layer of chocolate at the bottom of the cookie layer could only make things better! Interesting use of those pecans, which I love as well. Thank you for the suggestion. 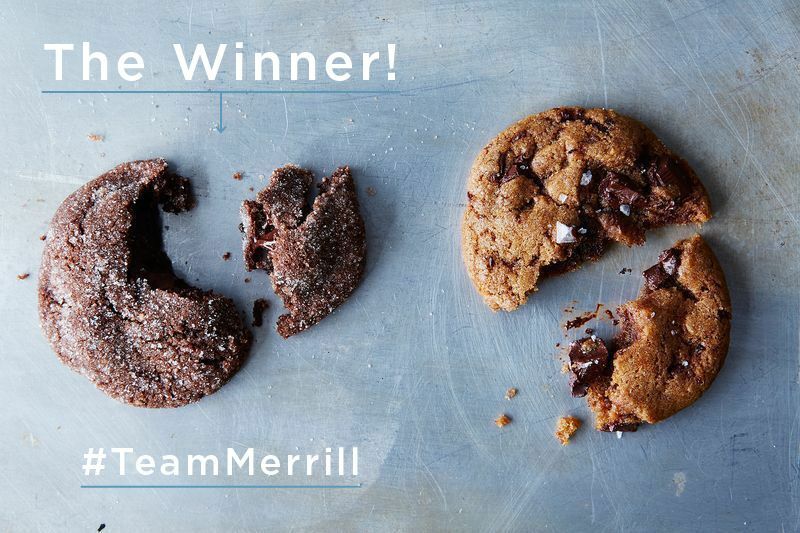 Merrill: a new take on the linzer cookie? Thinking a chocolate cookie as opposed to the traditional; maybe an out-of-left-field jam. Amanda: what about adding chopped chocolate or some caramel to a traditional molasses cookie and pumping it up with fresh ginger, plus a little romp in some rosemary sugar? All cookies should romp, after all. Thx! Love chocolate and jam together. This is a great idea. One of my all time faves is the King Arthur Flour Choc Chip (link: http://www.kingarthurflour.com/recipes/crunchy-whole-grain-chocolate-chip-cookies-recipe). it gets top marks every time i bake it. A cookie recipe i am looking for it a bacon-shortbread with maybe pecans, and don't forget maple something. I was thinking a riff off my son's favorite maple bacon doughnut. if anyone has a keeper already please speak up. Amanda: Fannie Farmer's original chocolate chip cookie is crispy and chewy, wrinkly around the edges, really buttery, and basically perfect. I could definitely see that with a little ginger treatment! Merrill: I think a Russian tea-cake or Mexican wedding cookie has the texture you're going for... lots of ground nuts + powdered sugar. It could be fun to do a spiced up twist, maybe with warming spices like cardamom and cinnamon. And I'd go for scraped vanilla beans! I have always had such a soft spot for these -- I'm fact, I was thinking of them when I was writing out my ideal cookie description. These are great suggestions for modifying, thank you! Amanda: How about these chubby, crunchy ginger amaretti https://food52.com/recipes/3821-ginger-amaretti-variations You could add chunks of chopped dark chocolate in place of the sour cherries. For Amanda: Black bottom-inspired chocolate cookies (cakey/chewy dark chocolate cookies with a swirl or dollop or thumbprint of cream cheese/crème fraîche and candied ginger). Reminds me of cupcakes my mom used to make; loved them. Appreciate your good ideas! Thanks Erin! I've made these Martha cookies as well -- so delicious! Brown sugar or Sucanat makes cookies chewy; I prefer crispy edges, so if I use either of those for a deeper flavor I also bake at a lower temp for longer - getting crispy edges with a chewy interior. Browning butter also gives extra caramel flavor and adds to chewiness. Merrill I have a peanut butter cookie that has exactly the texture you talked about. I often add chopped peanuts and/or chocolate chunks for extra heft and goodness. I'd be happy to share the recipe. Just let me know. Merrill—your crispy, crunchy oatmeal cookies might be a good place to start!